Seems like in most of the US today, it’s rainy and windy and a little bit cold. Starting to feel like fall! And while those of us in the Deep South don’t believe for a second that it’ll stick–we regularly find ourselves in short sleeves on Halloween–it’s nice to start to look at our autumn closets and see a whole new range of possibilities. Scarves! Jackets! Sweaters! SWEATER VESTS!! That’s right. 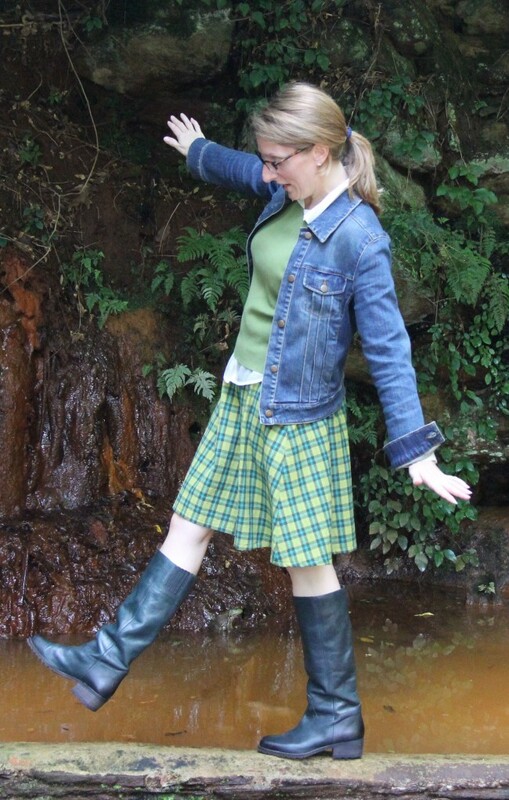 This was one of the first skirts I sewed from the Get Up & Go pattern, because my on-going obsession with All Things Plaid demanded it. I’ve had this yarn-dyed cotton in my stash for AT LEAST six years, and was thrilled to find the perfect project to pair it with. 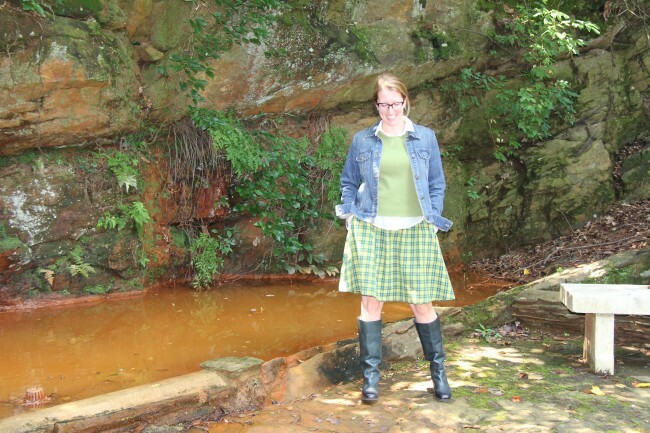 When I realized that it ALSO matches my sweater vest and boots flawlessly, well…magic, people. This is how magic happens. Although it’s not included in the pattern, I did add an in-seam pocket to this skirt. 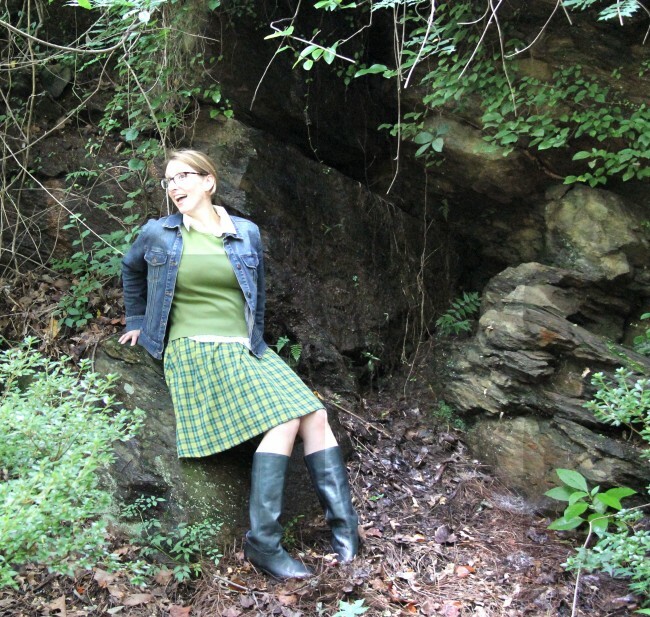 I love the versatility, and it’s so simple to add to any pattern–there’s a template and instructions in the Pockets E-Book that will apply directly to this skirt. I like to place my pockets high enough that the upper edge can be trapped beneath the waistband in the front, so they don’t flop around and get lumpy. The design of the Get Up & Go Pattern makes it easy to match stripes and plaids, with a simple side notch that can be placed on your pattern repeat to get your fabric design to line up. 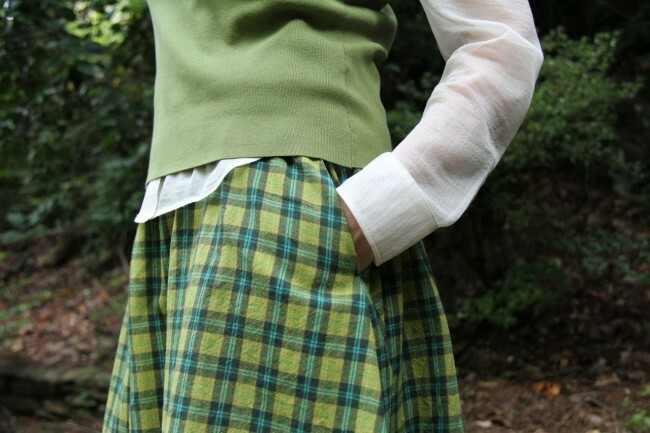 Read more about using notches in this post, and on sewing with plaids in this post, and remember that the Get Up & Go is a Learn As You Sew pattern–which means there’s a video embedded in the PDF that specifically walks you through how to use and cut notches to make them work for you as you sew! I really love that the format of this pattern makes it SO clean and efficient to learn new skills, right when you need them. I had such a great time shooting each segment, and putting them all together to make a really cohesive sewing journey for this pattern. You can get your own copy right HERE, and get sewing right away!! 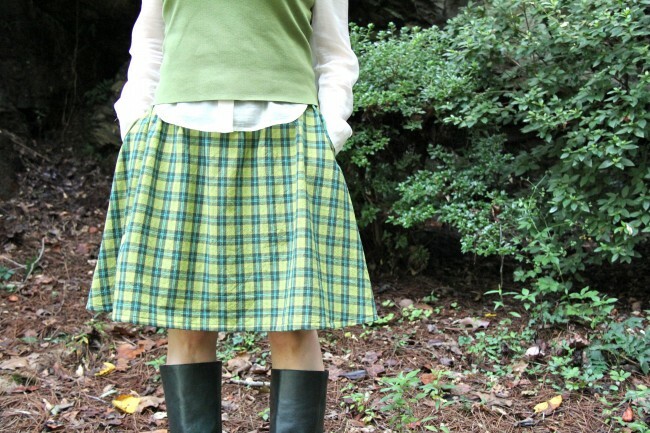 ← The Get Up & Go Skirt Pattern is HERE! I didn’t knew this blog, but i’m going to follow from now on. I’m so excited to have you here! I hope you’ll browse some of the older posts and let me know if you have questions. Welcome! Thank you!! 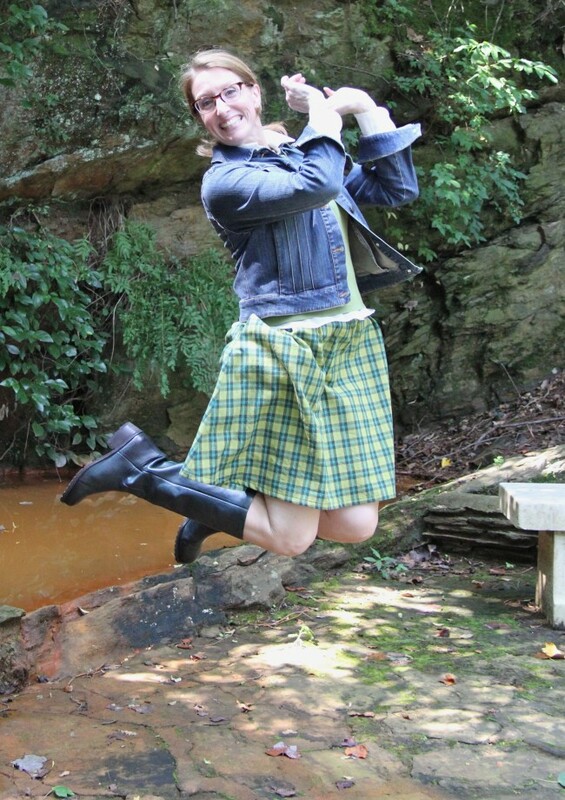 I’ve got a flannel plaid one to share, too–oh, my goodness, I’ve never worn a more comfortable skirt. Can’t wait for you to see it! Hello! We l.o.v.e. your skirt! Great pattern! Oh, thank you so much!! I love it, too–I have a dozen of my very own! So excited to know you like it! I want to sew that skirt! Although I think then I would need to buy those boots as well! Haha! I love those boots. They’re actually a super, super dark blue, so they don’t go with everything like I’d hoped, but they look amazing with this skirt! Woot! What a lovely skirt! And it has pockets! Can it really get any better? I looooove this version–the plaid is autumnal, but the fabric isn’t too heavy, so it’s a great transitional piece for weather like ours. And the pockets are required equipment, right? love this skirt, Deborah!! I need to learn how to match stripes and plaids like you do.